Zlatan Ibrahimovic had a goal and an assist as the Los Angeles Galaxy snapped a seven-match winless streak and boosted their playoff hopes with a 3-0 victory against the visiting Seattle Sounders on Sunday in Carson, Calif. The Galaxy (11-11-8, 41 points) pulled within three points of sixth-place Seattle (13-11-5, 44 points) in the race for the Western Conference's final postseason berth, though the Sounders still have a game in hand. Los Angeles goalkeeper David Bingham was forced to make just one save in posting his seventh shutout of the season. Ibrahimovic opened the scoring on a penalty kick in the ninth minute after Sounders defender Brad Smith brought down Galaxy forward Ola Kamara in the box. The goal was the conference-leading 18th of the season for the 36-year-old Ibrahimovic in just 23 MLS matches. Kamara scored in the 40th minute, with Ibrahimovic and Romain Alessandrini getting assists, to give the Galaxy a 2-0 halftime lead. Alessandrini took a pass from Ibrahimovic and drove down the left wing to the touchline, where he made a low cross to a sliding Kamara, who just beat a Seattle defender to the ball and redirected it into the net. The goal was reviewed to determine if the Galaxy stayed onside on the play, with video confirming the call. 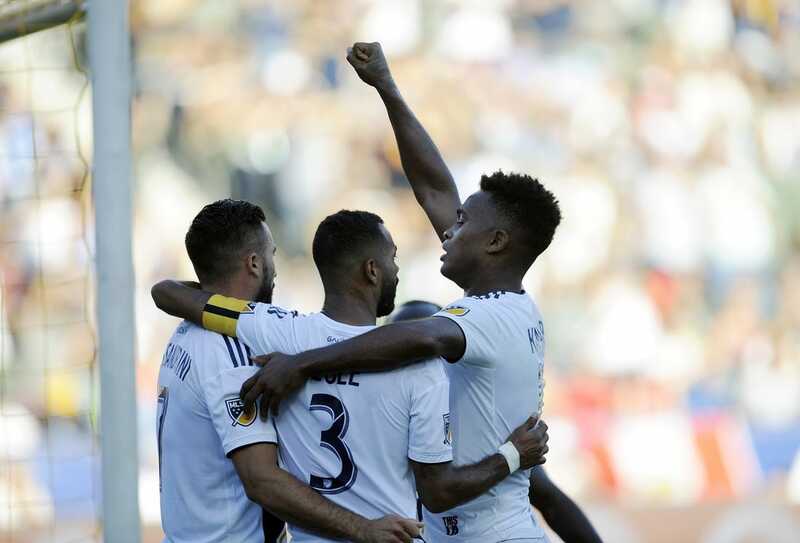 The Galaxy made it 3-0 in the 52nd minute as Emmanuel Boateng scored off an assist from Alessandrini. A Seattle defender knocked the ball off Alessandrini's shin as the L.A. midfielder drove the left wing. The ball deflected to the top of the 6-yard box, with Boateng winning a race to the ball and poking it past Sounders goalkeeper Stefan Frei and just over the goal line. The Sounders lost their second in a row after having their league-record, nine-game winning streak in the post-shootout era and a 12-game unbeaten streak snapped Wednesday, when 10-man Philadelphia scored in second-half stoppage time for a 1-0 victory. Los Angeles avenged a 5-0 loss Aug. 18 in Seattle, a game in which Ibrahimovic didn't play because of the turf at CenturyLink Field.